Many debtors considering bankruptcy are often holding out hope that they can somehow settle their debts for pennies on the dollar like advertised on the late night debt settlement infomercials. But debt settlement is not as easy or pain free as the debt settlement merchants would have you believe. Let’s take a look at some of the hard-cold facts:*If you want to use debt settlement, you need CASH. In plain English that means that if you want to settle a $4000 debt for $2500, you need $2500 available right now to hand to the creditor. Most creditors will not do any payment plans for debt settlement. *For debt settlement to be effective you really need ALL of your creditors to agree to settle your debts, because otherwise you can settle a debt and still be in a financial hole. For example, if you settle that $4000 debt for $2500 and have another creditor who refuses to negotiate on let’s say a $10,000 debt, you still owe that money and may need to file bankruptcy anyway. Oh, by the way, creditors are NEVER required to negotiate on a debt you owe. 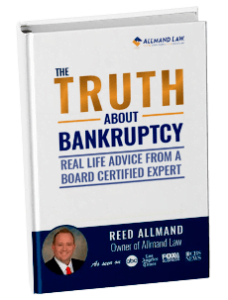 Only bankruptcy can force a creditor to reduce a debt obligation. *And finally, debt settlement takes time, effort and very good negotiation skills. Most debtors considering bankruptcy, really need debt relief immediately because they’re facing wage garnishments , lawsuits, foreclosure or some other pressing financial crisis. If you are drowning in debt and have multiple creditors, don’t delude yourself into believing that there is a painless way to get rid of debt. Find out the facts. Contact a Dallas-Fort Worth bankruptcy attorney today.